Zone Improvement Plan. I wondered how adding a bunch more numbers was an improvement. I lived in Akron 13 and had phone number UNiversity4-xxxx. You know you are old if you can remember what a postal zone was. Of course you are also getting old if you know what a dial tone is. Larger cities used "zone numbers". 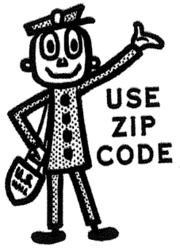 Does anyone else remember the Post Office commercial introducing the Zip Code, with Ethel Merman singing Zippity Do Dah?